Lao-Tzu wisely said that “a journey of a thousand miles begins with a single step.” Before that, you have a dream – a destination in mind. We set out to build the greatest cooler ever made. This is our story of a thousand miles, one single step at a time. I expect to share an update on badge designs this week. First, I wanted to share some work on the awareness. This whole campaign was built around Veteran PTSD awareness and we gathered a lot of information this Summer, especially over Memorial Day weekend. 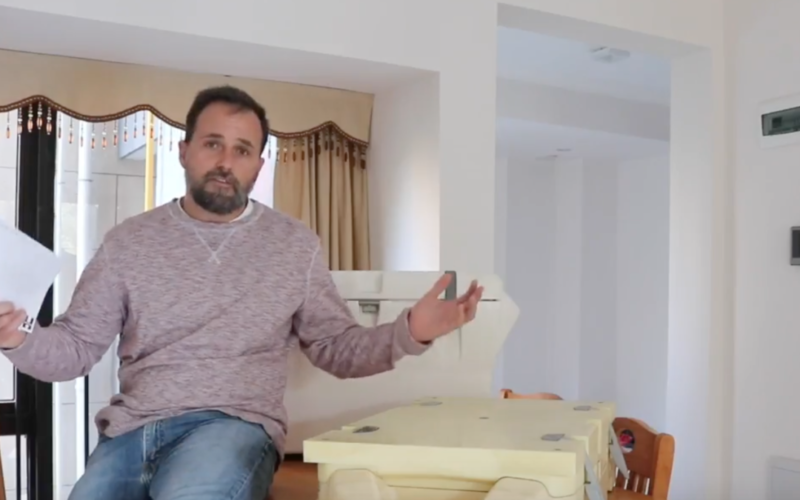 Robin & Geoff (both original Maluna Kickstarter backers), shared their stories. Geoff’s story was edited prior to campaign launch and is included in the body of the campaign. However, Robin’s story included some very interesting perspective about PTS among the female veteran community, and causes of PTS that are non-combat related. Robin’s story required a bit more time, and we recently released her story during the campaign. Thank you again to both Robin & Geoff for the courage to share your stories and help raise awareness.  The big goal and hurdle for me right now is to get production started. Getting purchase orders in place for new color resin and making some estimation of how much we will need and the probability of ‘unlocking’ a second color combo choice. Production for rotomolded coolers takes time, they each spend about an hour in a large mold, plus several hours of additional so I need to get things started and build the right balance of production estimates and tooling. We have just over 900 backers right now and I’m confident on the November deliveries for existing backers. I have closed out the November delivery rewards and created new December reward tiers. No differences, just to set expectations on deliveries. Speaking of production, I have had a lot of questions about *WHY* a rotomolded cooler and *WHY* is Maluna of better construction than the others? See below for an introduction to the Maluna manufacturing that came to life from last year’s Kickstarter. I should clarify (as I did in the FAQ), that the Combat 22s come with a standard drain plug. The Maluna thermometer drain plug does fit and is available as an accessory and is available at www.maluna.com. NIGHT 1 LIVE FUNDING : Goal hit in 2 hours !! THANK YOU to all our backers that brought us to our goal in 2 hours! Project is funded. NOW my focus turns to execution. But PLEASE continue to share this project with everyone you know. This project on Kickstarter is very unique because it is a volunteer effort to get coolers to our veterans. Click here to see a live video from when we hit our goal. Combat 22 is a project to bring a new 22 quart Maluna cooler to life and also provide coolers to help our veterans. The project was submitted to Kickstarter for approval on July 30, and is pending approval. We currently expect to launch on time and will provide updates here. Kickstarter is an online platform designed to bring new projects to life. Project creators, like myself, put together a plan for a project and seek support. Supporters provide ‘pledges’ and Project Creators bring the project to life and provide ‘rewards’ to the supporters. The project will have a minimum fundraising goal, if that goal is hit, the project will kick off. If the fundraising goal is not hit, no pledges will be collected and the project will not proceed. WHAT IS THE NEW 22 PROJECT? Combat 22. 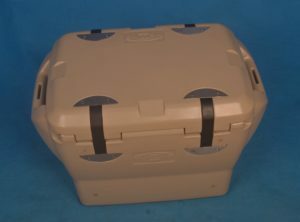 A new 22 quart cooler that is a special edition just for this project and represents support toward providing coolers to help veteran organizations. The Combat 22 will be constructed with the same quality and performance that brought Maluna to life. WHY IS MALUNA DOING THIS? Maluna was created from this community, which has many veterans. The veterans (Abraham Engholm) requested a 22 quart cooler to help veteran causes. The Maluna community has many veterans that have personally suffered from PTSD and we have many members in our community who have lost friends and family because of PTSD. The entire Kickstarter project and proceeds will be used entirely to create coolers for the ‘rewards’ for the supporters, and also create coolers for veteran organizations like The Fallen Outdoors. WHERE DO THE MALUNATICS HANG OUT? WHAT IS THE RELATIONSHIP WITH THE FALLEN OUTDOORS? An original Maluna supporter in the focus group, Brandon Tarron, is a pro-staffer for TFO. He introduced us to them as a volunteer organization that helps veterans go on outdoor adventures, and they need coolers. Maluna makes custom badged coolers, and offered to provide a special edition TFO 22 in this project and direct those extra coolers directly to their organization for their benefit. The fit is perfect. HOW DO I PLEDGE FOR A COMBAT 22 IN KICKSTARTER? If the funding goal is hit, your credit card will be charged at the conclusion of the campaign, scheduled for Sep 1 at 6pm PST. Maluna will receive funds shortly after the end of the campaign and will kick off the project and will create and ship rewards (target October, and scheduled by November). You will have a unique ‘backer number’ in the project that will be assigned as soon as you submit your pledge. This is done by Kickstarter. You can only choose one reward. If you would like multiple rewards, you can choose a single reward, but increase the pledge amount for multiple rewards. If the funding goal is hit, there will be a ‘survey’ at the end where you will provide a shipping address and any select any options that might be available with your reward. You can pledge for more than one reward if you open a second Kickstarter account with a different email, and you would have a second backer number, but this should not be necessary. Feel free to ask within the focus group for the fastest response, or send questions to info@maluna.com. Maluna is very excited to announce our first partnership for the 22 campaign with The Fallen Outdoors. This is a perfect fit. TFO is 100% volunteer driven. They bring together veterans from all branches of the military for hunting and fishing adventures. I would encourage you to read through some of their testimonials for a better understanding of what they are accomplishing. Whether it is figuring out how to gear up a physically disabled veteran for a hunt, or just getting outdoors to provide light into those veterans that have come from a dark place, TFO is doing very good work. Brandon Tarron is a TFO Pro Staffer out of DFW and has been a member of the original Maluna Focus Group since before the Maluna Kickstarter last year. Thank you for your service, your volunteer efforts, and the introduction to The Fallen Outdoors. The 22 Kickstarter campaign will feature a reward choice for an official special edition cooler with The Fallen Outdoors logo. 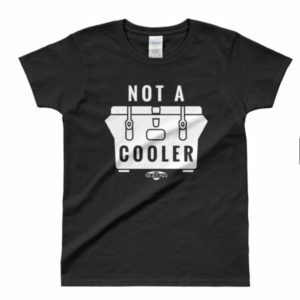 All of the profits from these coolers will go directly to providing Maluna coolers to help their efforts. Check out and follow their Facebook page for more information. The 22 campaign will also have other rewards available including a cooler that profits will provide coolers into various veteran organizations chosen by a veteran led committee within our Maluna Focus Group that is being formed. Maluna has been a project about co-creation. Through our successful Kickstarter launch last year, Maluna has grown through and for the supporters behind us. One Malunatic had the awesome idea to make a 22 quart cooler and offer it for the benefit of our Military Veterans. Thank you Abraham. This is what is happening now. Maluna will soon launch another Kickstarter campaign specifically for this purpose. In the future, after the Kickstarter 22, Maluna will continue to offer a Veteran version 22 for their benefit and will also have a standard Maluna 22 available. I have decided that 100% of pledged funds into this Kickstarter 22 project will go to support the campaign, provide pledge rewards to backers, and provide coolers to worthy organizations that will use them to help our Veterans. This will be a completely voluntary effort on the part of myself and Maluna. Schedule: Production tooling has been kicked off and I expect to have the first sample in early July. The entire month of July will be a strong marketing campaign to gain attention and gather supporters. July will be when we will need your help the most to spread the word. THE KICKSTARTER CAMPAIGN IS SCHEDULED FOR AUGUST 1-31. Production and tooling needs to match the size of the campaign which is an unknown right now, but I expect first deliveries to start the first part of October. Please share. Please participate. Please help. And be sure to include your email at MALUNA.COM/22CAMPAIGN to ensure that you will receive regular updates. P.S. Thank you to Geoff and Robin for your service, your advocacy, your vulnerability, your original Kickstarter support, and the friendship we have gained. Gel packs claim to outperform ice in keeping ice chests cool. 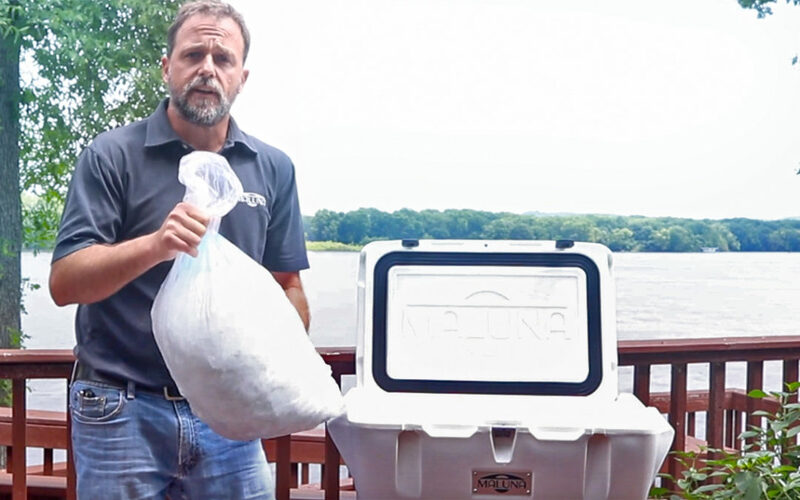 In this test, Maluna founder Scott Hoyt pits cooler gel packs against good old fashioned ice. 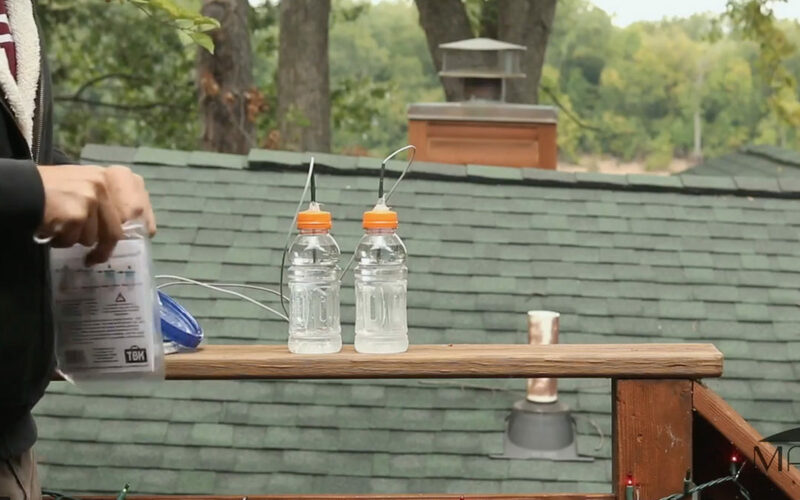 Watch to see whether the gel is worth the investment or whether you’re better off freezing some H2O. 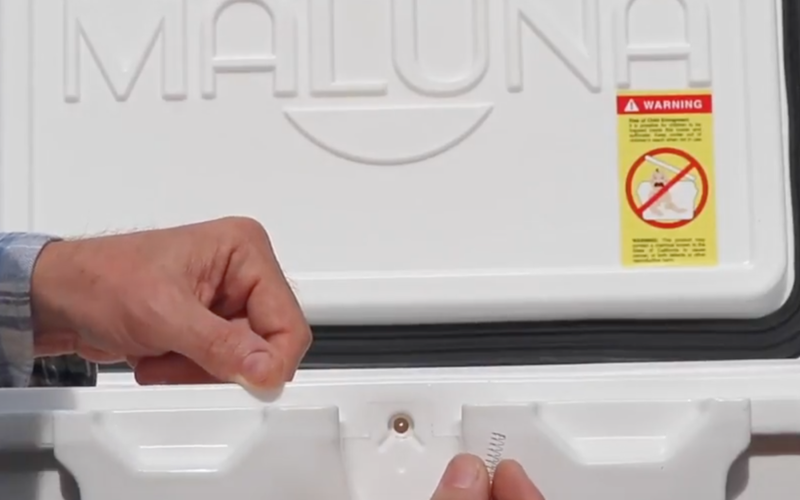 In the first “How-To” video, founder Scott Hoyt shows how to get a stronger grip on your Maluna cooler with some nifty hockey tape and even goes full chipmunk. 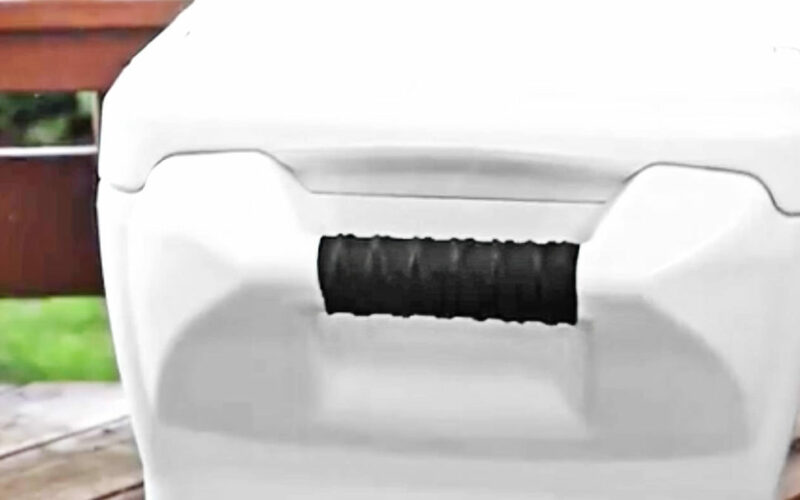 Small changes in elevation or even temperature can develop a vacuum lock on a cooler that makes it almost impossible to open. 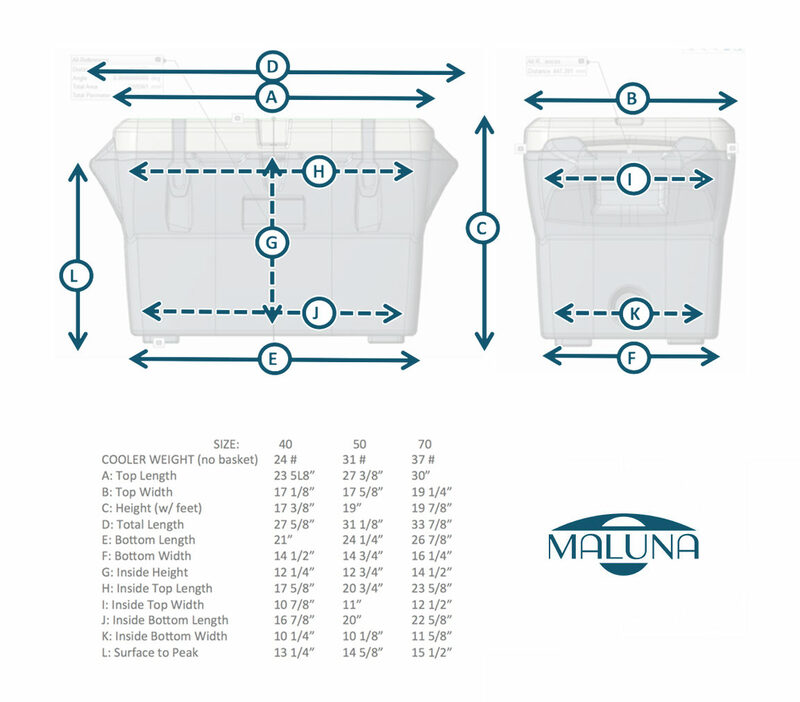 Maluna Unhinged coolers contain a patent-pending pressure regulator that maximizes the internal vacuum to -6 KPA and ensures that your Maluna can be easily opened. 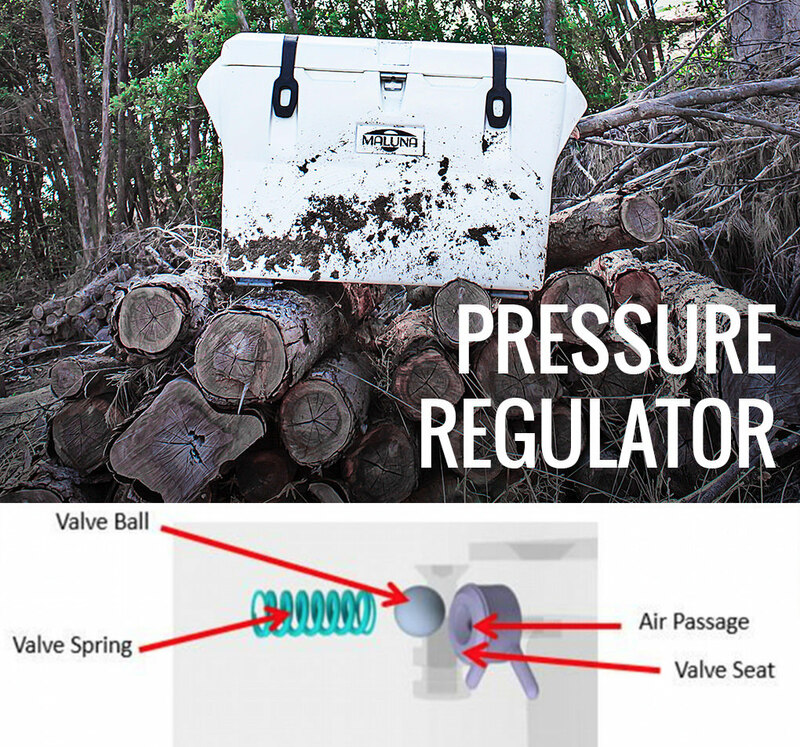 Located behind the bottle opener, the pressure regulator contains a calibrated spring, a ball, and a rubber seat. Remove (unscrew) the bottle opener. Locate the rubber seat which looks like a round plug with a pinhole in the center. Gently push a pin or thin drill bit through the pinhole and feel for the ball inside. The ball inside should move with pressure applied and push back against the seat. It’s been a few weeks since we were successfully funded on Kickstarter and fulfillment is in full swing. Our first backers have already begun to receive their coolers and even more or on the way. Maluna founder Scott Hoyt is spending the weekend stuffing decals into envelopes and sharing some thoughts on the fulfillment process. 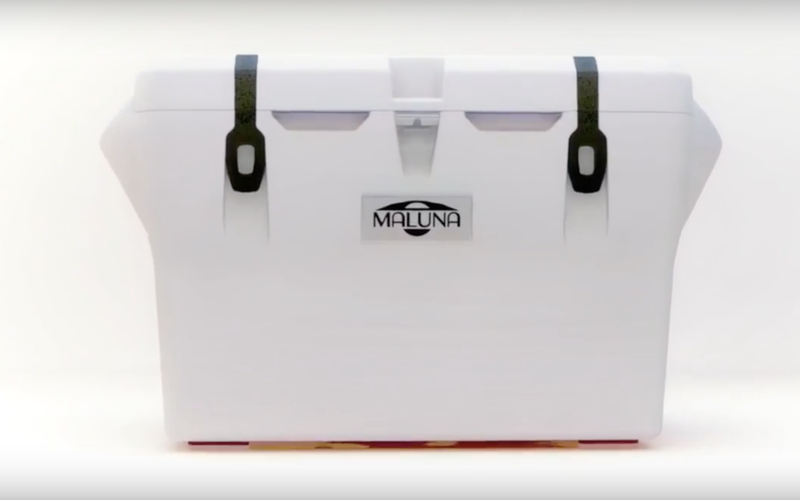 Today is the final day of the Kickstarter campaign, and Maluna creator Scott Hoyt is showing off everything that goes into making the world’s best cooler. In this post, Scott walks through the early concept of the cooler and shows the evolution from idea to design and prototype. 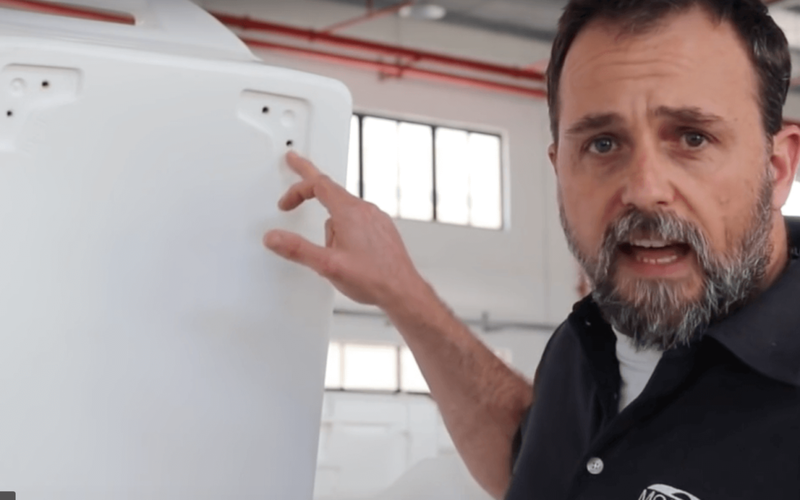 We’re just 1 day away before the Kickstarter campaign ends and Early Bird coolers start shipping out, and Maluna creator Scott Hoyt is showing off everything that goes into making the world’s best cooler. 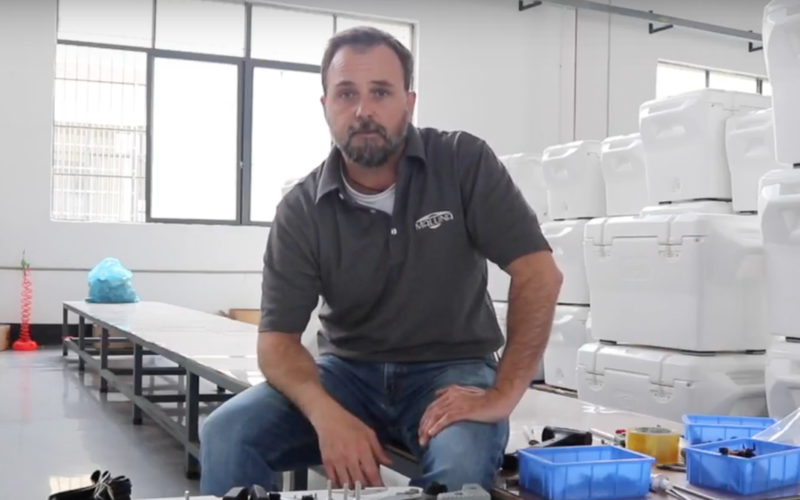 In the final installment of this four-part series, watch the careful attention to detail and the meticulous process by which the finishing touches are applied to each cooler before shipping. We’re just days away before the Early Bird Kickstarter coolers start shipping out and Maluna creator Scott Hoyt is showing off everything that goes into making the world’s best cooler. In part three of this multi-part series, watch how the coolers are insulated and take a tour of the Maluna graveyard. We’re just days away before the Early Bird Kickstarter coolers start shipping out and Maluna creator Scott Hoyt is showing off everything that goes into making the world’s best cooler. 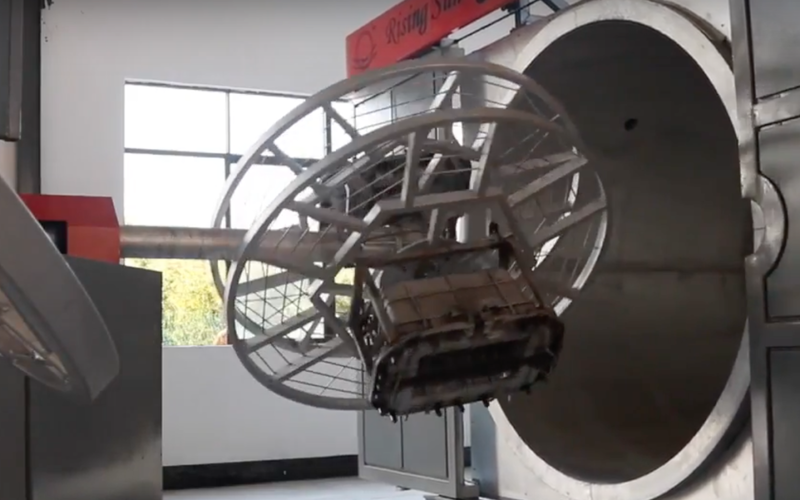 In part two of this multi-part series, watch how the ultra durable Maluna cooler shell is rotormolded and cooked in a car-size oven. 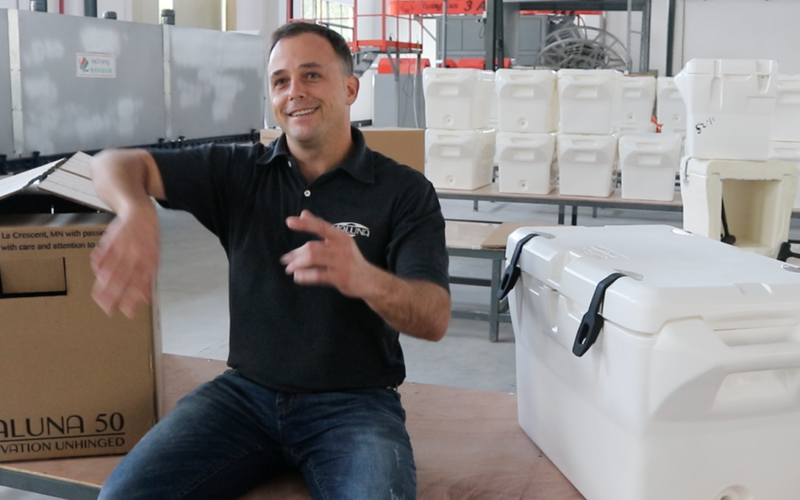 We’re just days away before the Early Bird Kickstarter coolers start shipping out and Maluna creator Scott Hoyt is showing off everything that goes into making the world’s best cooler. 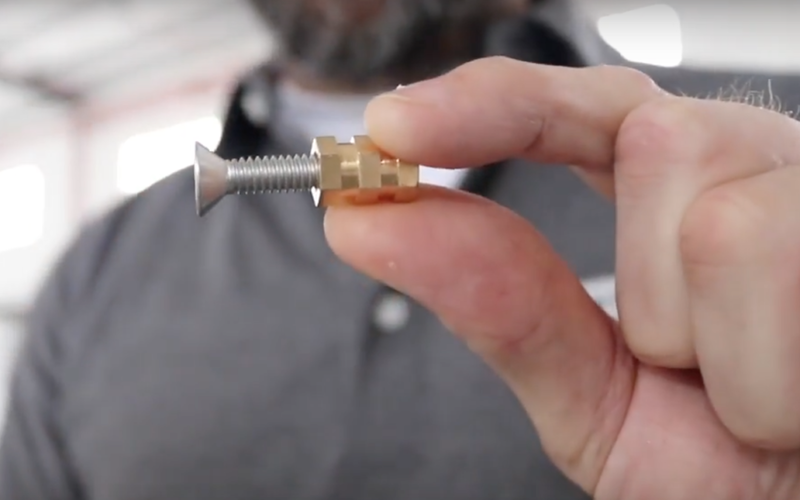 From the durable, polyethylene shell and polyurethane insulation to the drainplug, handles, and all the trimmings, follow Scott through Maluna’s production facility in this multi-part series behind the scenes look. I spent several years of my career studying thermal dynamics for food safety, managing the design and manufacturing of insulated products. I was in the trenches. The laboratories, the manufacturing facilities, supplier engineers, materials suppliers, assembly lines, thermal chambers, temp probes, polymers, roto-molds, adhesives, coatings, injection molds, machines and buttons everywhere. Heaven. I was the guy always asking questions all day, and finding so much new stuff to click about. It was all in public domain, nothing secret, but I just had not found this world before. Energy is a funny thing – heat takes the path of least resistance. A lot like electricity, water, and humans. But the biggest lesson I had while studying energy: Question everything. If I back up just a bit, there is a common thread through this. 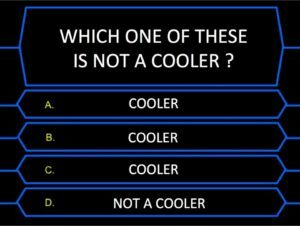 It was coolers. Nearly 10 years ago, I started traveling deep through the Baja desert several times per year. No matter your purpose in Baja, it is always a serious exercise in overlanding; a pursuit where preparation is the bedrock of success. You need to be damn sure you have a cooler that is up for the job. The only choice was Yeti. Back then, it was the longest lasting cooler, but they cost how much? REALLY? With one choice for a real cooler, people of passion paid the price. Perhaps that was their pricing strategy. While I was in the trenches of thermal chambers and manufacturing facilities, I started to give my Yeti cooler the stink eye. You should NOT cost that much. It actually frustrated me because I felt like I was getting a pretty good look at the truth. From what I knew, I could build a better cooler, but I continued with my existing mandate. I did nothing up to this point. Until I took inventory. What did I have? I had thermal knowledge. I had manufacturing knowledge. I had manufacturing resources. And I had a problem. My problem existed that people were still paying way too much for coolers that should be much better. I witnessed RTIC come to market. They fixed the pricing problem, but they did not fix the value problem. Zero innovation beyond replication. Others coolers showed up also, but nobody was innovating. The coolers should be much better. And Yeti? They are so expensive among other options – now a rather theatrical consumer purchase. And if they are as tough as you say, why does Yeti only have a 5 year warranty? Why does everyone make the same cooler with the same seal that’s designed for a freezer? Why don’t they design a seal for a high performance cooler? Now I’m not really sure how this next part happened. I think if it could be explained, or bottled up – then it wouldn’t actually exist. But I experienced it. I resisted the path of least resistance, and I started to put one foot in front of the other toward an unthinkable challenge. I had to find out if I’m supposed to build this new cooler. I cut up my Yeti cooler into pieces (Don’t worry Yeti, it’s way past your 5 year warranty). More questions, more clicking. I built some proofs of concepts, tested, poked at, and determined yes, I can definitely build a better cooler. Phone calls, quotes, estimates, meetings, agreements, pushing, pulling, and suddenly one day, I said to myself “I’m going to do this. I’m going to be the cooler guy”. That was just over a year ago. During that time, I proved that my crazy hinge idea and other improvements absolutely holds ice longer. I drew a huge smile when I found this to be not only an idea, but the truth. I found my professional purpose, it was now MY challenge, and I decided to own it. 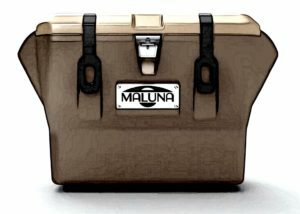 I have designed, built, and tested the Maluna Unhinged cooler. It is awesome. By far, my biggest ever accomplishment. I just delivered more than 100 trial production run coolers to the Maluna Unhinged Focus Group on Facebook, and everyone is super stoked. Thank you to everyone in that group for your continuing support and encouragement. Please keep it up, I need it. I have worked with my partners to prepare a dedicated overseas production facility, with brand new equipment. I have designed and built production and QC procedures, put together a production schedule, secured materials supply sources, prepared a fleet of molds to support a strong production presence. I have decided to offer this cooler as a project on Kickstarter. It’s scheduled for March 1 campaign, and I will be prepared. I will have a solid amount of inventory ready to ship to the early backers as soon as the campaign concludes, and if necessary, production will continue to double shift until every cooler is shipped. My manufacturing team is rock solid. I have worked well together with this crew on many challenges for several years, everything seemingly preparing us for this project. Here is the important part: The people, equipment, materials, and supplies are already in place to support the schedule of deliveries I will offer on Kickstarter. I intend to sell the Maluna 50 quart (actually 52.5 quarts) cooler for under $200 as a special price during Kickstarter with a lifetime warranty. This compares to the Yeti 65 (actually 57 quarts) which sells for $400 with a 5 year warranty. Please join me on this journey. I am less than 8 weeks away from launching the campaign, and there is a lot to do and discover. I’ve had a ton of fun sharing this journey so far and making new friends. I will continue to share every step of the way. 2017 is going to be a choice year, I look forward to sharing it with you.